The Siamese kitty boy with the gigantico imagination has returned for another loco adventure. 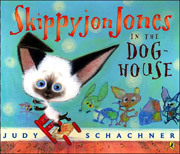 In his room for a time-out, Skippyjon Jones lets his imagination take him to a shack where his Chihuahua friends are yipping and yapping and hiding out from Bad Bobble-ito, who has taken over their doghouse. How El Skippito chills the Chihuahuas and banishes Bobble-ito will make more amigos for this endearing and irresistible rascal who made his first appearance in Skippyjon Jones.